The STX International Dehydra 600W model is a large food dehydrator with several excellent features. These include its durable stainless steel composition, 40-hour built-in timer, and expansive temperature range. The listed price has also recently been slashed by about 40%, which is rare for kitchen appliances of this caliber. At the same time, the dehydrator seems to have a few issues that may ward away potential customers. It is also limited in its total drying power and may not be the most convenient option for making jerky. A little over half of the reviewers gave five stars, with the rest giving a mixture of lower scores. All together, the dehydrator has a customer rating of 4 out of 5 stars in 37 reviews on Amazon. For the most part, the STX International Dehydra 600W model is well-respected for the high quality of its build and its ability to dehydrate not only a lot of food at once, but at a wide-range of temperatures as well. It also has a professional appearance and used to be very expensive when it was first released. Yet conspicuous problems with the machine have triggered somewhat mixed reviews and a dip in sales. Notably, several customers have noted that the front door does not always shut as tightly as it should.Â This can lead to heat loss during dehydration and occasional rattling. Other reviews claim that liquid when heating meat escapes from the machine and leaves a mess. Of course, the low number of total reviews puts the validity of these comments into question. However, better options may be available for you depending on your cooking needs. What Does the STX International Dehydra 600W-SST-CB Come With? A huge contributor to the high cost of the machine is its stainless steel construction. Made from high-caliber material, the drying trays help improve the rate of dehydrating as well as the taste of the food being heated. On the other hand, the sliding front door may counteract this boost in drying power because it does not seal off the heat as well as hinged doors do. Silicone mats are a nice touch to the package. Not all dehydrators offer mats.Â Those that do, often provide mats made out of teflon, which is not as safe as silicone. The digital control panel is an outstanding feature. Its temperature range of 40Âº F gives it one of the highest ranges among commercial dehydrators. And whereas most dehydrators come with timers that keep tabs for up to 24 hours or fewer, this machine tracks its work for up to 40 hours. Last of all, the free cookbook included in this package is filled with more than 270 recipes.Â It also includes dehydrating tips, food preparation, and diverse drying guides. The recipes are all on a CD and can be useful for newcomers. How Much Drying Power is This Dehydrator Packing? The self-descriptive STX International Dehydra 600W-SST-CB is powered by 600 watts. This amount of drying power is sufficient for the dehydration of most foods, but is still low considering the large size of this machine. Along those lines, the dehydrator does not hit a maximum temperature of 165Âº F.Â Meat needs to be heated for a while at that temperature in order to be free of potentially harmful bacteria. 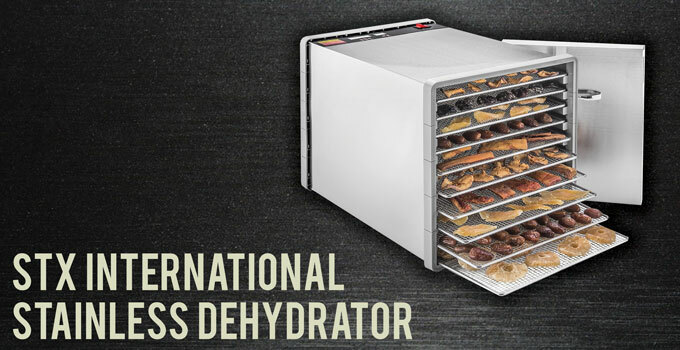 This unfortunately means that people who want to make jerky with this dehydrator will need to first cure the meat at that temperature (or higher) for a short while before dehydrating it. The good news is that the dehydrator can otherwise dehydrate everything else without concern. In fact, its temperature range of 85Âº to 155Âº F is one of the widest available. Moreover, the machine employs a horizontal airflow mechanism with a rear-mounted motor and fan that assures even drying. 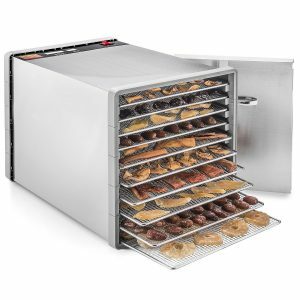 If you are insistent on sticking with the STX International line of products, you have the option for the dehydratorâ€™s larger, sister model that comes at 1200 watts and certainly meets the temperature requirements for cooking meat. How Large is the STX International Dehydra 600W-SST-CB? This dehydrator is sizeable but not so big that it seems imposing. Its dimensions are 13.8 by 12.5 by 19 and it has a weight of 22.5 pounds. You should probably set the machine on the floor or on its own rolling island.Â It can also fit on larger kitchen counters if need be. Its drying trays are also big but still small enough to be washed in a standard kitchen sink with a little bit of maneuvering. The steel composition of the dehydrator is the primary inspiration for its design.Â It has a clean silver finish besides the control panel on the back end. This gives it a fairly professional look that should blend in easily in most kitchens. Noise, on the contrary, can be a potential issue for some users, especially for those who get a slightly faulty machine. To be more specific, the sliding front panel of the dehydrator has been said by reviewers to sometimes fit on loosely. When not perfectly secure, the door for the dehydrator can rattle nonstop due to the rear-mounted motor blowing heat toward the front of the machine. It is important to note that only a select portion of customers have brought this up, which suggests that the problem may have occurred somewhere along the production line and might not be caused by an inherent design flaw. Keeping in mind that there is a more powerful and better reviewed dehydrator version of the STX International Dehydra made by the same company and costing nearly the same price, it might seem obvious to avoid purchasing this machine all together. Also important to restate for those on a budget, this dehydrator has recently gone through a substantial price cut, making it much more affordable than before.